This dream home with sauna is the ideal holiday home for people who love flora and fauna. 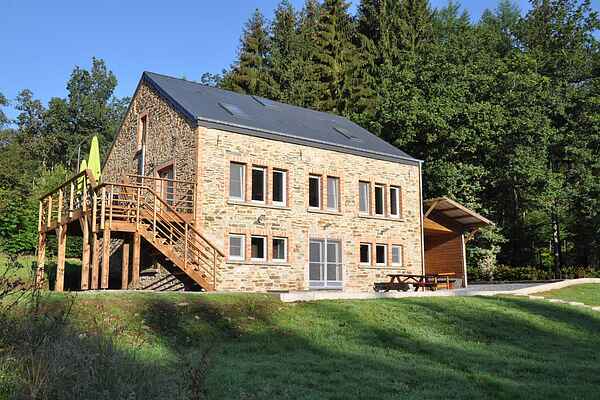 This typical Ardennes holiday home is wonderfully situated in an open area in a forest at the end of a dead end road, surrounded by a large garden with a brook. The area surrounding the holiday home is a Natura 2000 protected ecological area. The holiday home is tastefully renovated and decorated in a modern style. You'll feel right at home here and definitely won't be bored for a minute! In the winter the wood burning stove makes for a wonderful ambience and warmth and the sauna is the place to relax. Children will have fun in the playroom or in the sand pit. This holiday home is aimed at families. You are in the region of the Baraque de Fraiture, a true paradise for hikers, bikers and ski enthusiasts in winter. From the holiday home you'll walk through the forest and reach the brewery of Achouffe. Early in the morning or in the afternoon you may spot some deer around the home. There are several day trip options in the area. Go have a look at the rocks of Hérou (5 km) or a little further up there are the villages of La Roche en Ardenne and Durbuy.